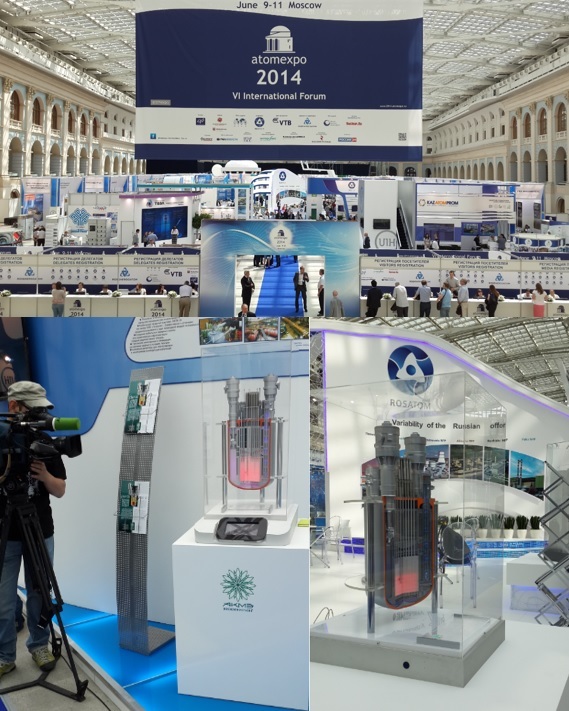 On 9-th of June 2014 the 6-th International Industry Forum ATOMEXPO-2014 has opened in Moscow. In the opening ceremony of the Forum the following key representatives have participated: Kirill Komarov, Rosatom State Corporation, Deputy Director General on development and international business, Agneta Rizing, World Nuclear Association (WNA) Director General, Takuya Hattori, Japan Atomic Industry Forum (JAIF) President, and others. AKME-engineering is demonstrating the SVBR-100 project at the exhibition stand of the State Atomic Energy Corporation Rosatom and at the "Science and Innovation" exhibition stand. ATOMEXPO-2014 is one of the central global nuclear industry forums dedicated to the most relevant matters of nuclear energy development. In a framework of the forum an intense business agenda as well as a large-scale exhibition of Russian and foreign nuclear energy and industry companies is organized. This year the Forum is held under the “Atomic kilowatt/hour - a new product of the energy market” motto. ATOMEXPO-2014 is opened till 11 of June 2014.